Masters students from the Victorian College of the Arts recently took part in a fieldwork intensive in the Bass Coast region of South Gippsland. Their aim? To explore how how indigenous knowledge sensitises us to the historical and contemporary complexities of regional sites. How can art help us understand a place? If that place is somewhere new to us, how can we go about orienting ourselves to it? And how can indigenous knowledge sensitise us to the historical and contemporary complexities of regional sites? These were some of the questions explored by Masters students from the Victorian College of the Arts in a fieldwork intensive I coordinated in the Bass Coast region of South Gippsland in April 2017. The four-day visit was centred on the event Luminous Streets, a component of the Regional Arts Victoria Small Town Transformations initiative The Edge of Us, which links artistic works in five small towns along Westernport Bay. With only a short period of time to get to know the area, students used a range of strategies to engage the event – some artists, such as Rich Keville, produced their own artistic response to the site in the form of luminous “graffiti” attached to the pier; while James Howard composed audio works based on field recordings taken at the site. Other students took a more documentary approach, with Jared Kuvent taking long-exposure still photography, while Cath Rutten used interview techniques to generate data that produced a musical score – making a creative response to the typical evaluation strategies used in her work as a cultural planner. The idea of “fieldwork” is best known in anthropology, and so the question of indigenous knowledge was central to student learning of both the site and the opportunities that fieldwork methods might present. I invited renowned Māori artist, curator and academic Dr Huhana Smith, Head of the School of Art at Massey University in Wellington, New Zealand, to act as guest faculty for the site visit. Dr Smith presented her community-based action research project Manaaki Taha Moana: Enhancing Coastal Ecosystems for Mäori in a seminar at the Faculty of VCA & MCM’s Wilin Centre for Indigenous Arts and Cultural Development before joining the students out on the fieldwork site, where they were welcomed to country by Boon Wurrung artist Steve Parker and participated in a smoking ceremony. Working with my colleagues in the arts collective Local Time, who also joined the intensive, I’ve spent the last ten years researching how artists can engage questions of indigenous knowledge and political struggles for self-determination in a respectful fashion, to enhance our sensitivity to intergenerational local knowledge of habitat and the ecosystem. 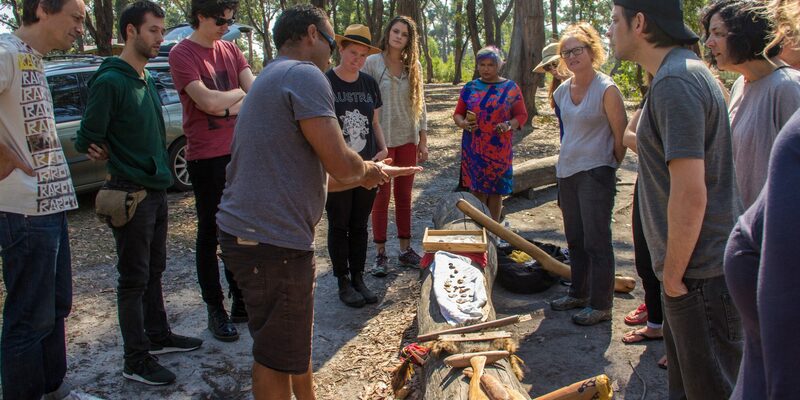 Across the world, local communities and indigenous researchers such as Dr Smith are actively working to undo the impact of colonisation on customary methods of caring for the land. Indigenous knowledge now has urgent relevance as we seek sustainable ways of life in an era of widespread environmental degradation and climate change. While a short visit to a regional arts project could only begin to point at the potential openings for artists into these questions, the experience highlighted for students the value of place-based learning and the benefits of a holistic approach to research and community engagement. This wasn’t just a one-way flow of information, but a real exchange. Outside of their own learning, the students contributed significantly to the Luminous Streets event with their presence and engagement. They gained first-hand insight into how a large-scale community arts project works and I’m really excited to share their findings with the organisers. Working with tutor and artist Amy Spiers, the students are currently finalising their research reports and responses. I will be sharing them with the Regional Arts Victoria project team to feed into the next iteration of the project in 2018. Jared Kuvent’s documentation of Luminous Streets and the fieldwork visit is available on his Flickr page. Image: Boon Wurrung artist Steve Parker introducing the class to the material history of the Westernport area. Photo: Jared Kuvent.